The Bose SoundLink Mini may not be the loudest portable Bluetooth speaker on the market, but it's one of the best sounding and really packs a punch considering its compact size. Bose has produced a number of portable speaker systems in the past, but the SoundLink Mini marks the first time it intends to compete on both size and price. Designed for devices like smartphones and tablets, the SoundLink Mini is one of the best sounding portable Bluetooth speakers on the market and really packs a punch for its compact size. Bose has a reputation for impressive design, and the SoundLink Mini is no exception. It's constructed from an anodized aluminium case that matches almost perfectly with the same material Apple uses on its MacBook Pro and MacBook Air notebooks. The case appears to wrap around the speaker, creating a rather unique look. 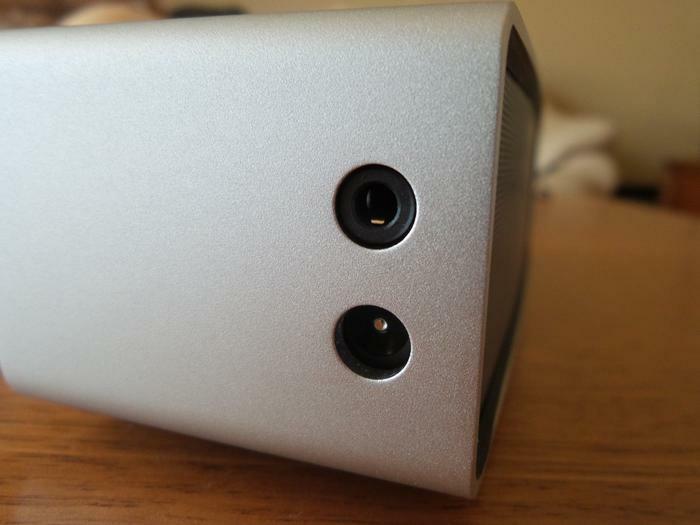 The edges of the aluminum are broken only by a grey speaker grill on the back and front. The sharp edges can actually dig into your fingers if you aren't careful, and the aluminium finish is unfortunately prone to light scratches. Bose sells an optional, silicone cover for the SoundLink Mini in three colours ($29.95), and a travel bag ($54.95) but both accessories are ridiculously too expensive for our liking. The SoundLink Mini has an attractive, aluminium shell. At 680g, the Bose SoundLink Mini is one of the heaviest speakers on the market. It's still light enough to slip in your pocket if you need to, and the extra weight really gives it a premium feel. A rubber base conceals the non-removable Lithium-ion battery and also prevents the speaker from slipping when placed on a flat surface. 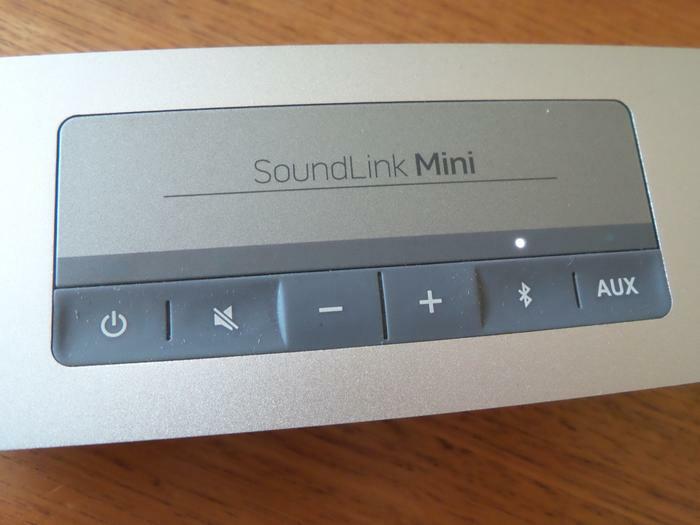 The SoundLink Mini has six buttons on the top including power, mute, volume up/down, Bluetooth and auxiliary. The volume up and down keys are slightly raised above the others, but all of the rubber coated keys require a very firm press to activate, so this can quickly become an annoyance. One other annoyance: the SoundLink Mini can't function as a hands-free speakerphone for your smartphone, unlike many of its competitors. The rubberised buttons on the SoundLink Mini really require a firm press. Bose includes a standard 3.5mm audio jack on the right side, just above an AC charger input. Unfortunately, the latter is a proprietary port and means the SoundLink Mini can't be charged by micro-USB. Bose does include a charging cradle in the sales package that neatly docks the speaker, but the AC adapter is chunky and you'll need to carry it with you if you are travelling. Most rival speakers, like the UE Boom, the Beats Pill and the Jawbone Jambox, are all charged by a regular micro-USB connection. 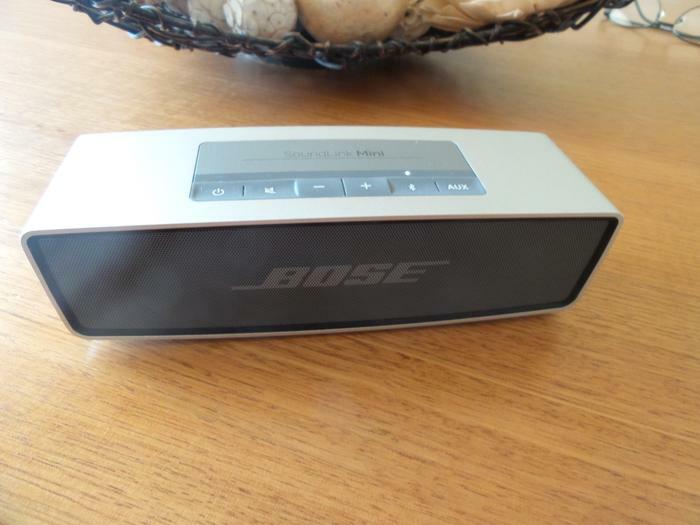 Setting up the Bose SoundLink Mini is as simple as you'd expect from a Bluetooth audio system. Press the power button to turn on the device where it will enter Bluetooth pairing mode automatically the first time, then connect your smartphone, tablet or other Bluetooth device. The SoundLink Mini can connect and remember up to six Bluetooth devices without having to pair them again. Bose has a poor reputation among many audiophiles (Buy Other Sound Equipment) with critics of the company often claiming the products are overpriced compared to competitors. The compact Bluetooth speaker market is hardly audiophile territory, however, and the SoundLink Mini is one of the most impressive we've heard in this category. Bose claims the device uses two passive radiators and two custom transducers to produce "better sound than any speaker of its size". The SoundLink Mini uses a proprietary charging port, so it doesn't charge via micro-USB. The SoundLink Mini produces crisp and clear sound with moderate, but not overwhelming bass. Mids and highs are excellent, but while bass is relatively impressive considering the size, it can be lacking depending on your musical tastes, and obviously can't compete with larger speaker systems. The SoundLink Mini isn't as loud as some competing Bluetooth speakers, but distortion is almost non-existent, even at full volume. The device produces loud enough sound to fill a small or medium sized room, but if you're looking for a larger space to fill then you'll need to opt for a larger and therefore more powerful speaker. 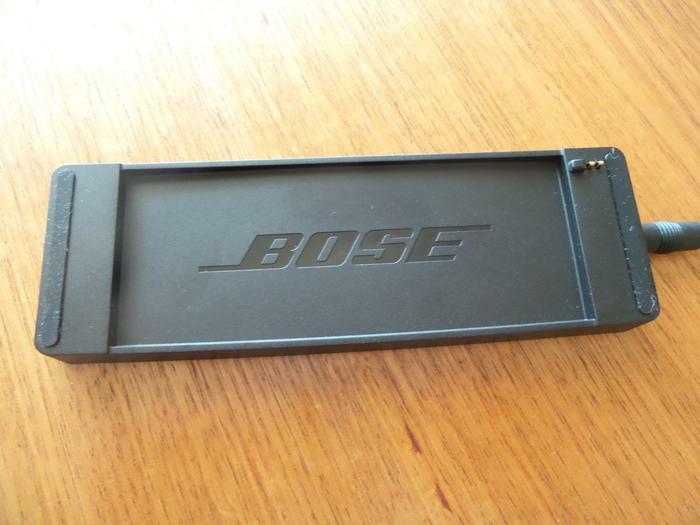 Bose includes a charging dock in the sales package. Bose says the SoundLink Mini's 2330mAh battery will last for seven hours before requiring a recharge. We managed to use the device for around six hours during testing, and found the unit takes around three hours to fully charge. Interestingly, there's a micro-USB port on the bottom of the speaker, next to the dock pin connector, but Bose says this is for loading future firmware updates to the device from a computer. The Bose SoundLink Mini Bluetooth speaker is available now in Australia and retails for $249.